The set designer creates the primary visual environment for the theatre production. There are five basic goals which reflect the set designer's balance of aesthetic and practical considerations. 1. 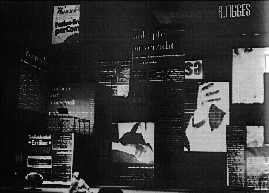 The set designer creates a design concept, which extends the director's production concept into a complete plan for the visual aspects of the production. The design concept will include the style of the scenery, the number of scenic locations and how stage action will move from location to location, and other information gleaned by the designer from a text analysis. 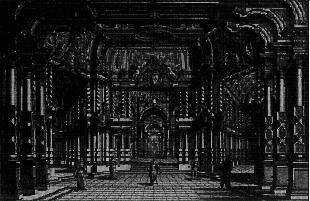 The concept may include a central metaphor or visual image, like the musical Chess, for which the entire visual environment was an enormous chess board. 2. Set the style and tone of the production. Today many theatres do not use the main drape, or curtain which separates the stage and audience; instead, the audience sees the set when it walks into the theatre. 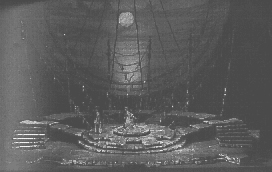 Therefore, the audience makes assumptions about the play's style and tone based on the set designer's work, before an actor walks on stage or a line of the play is delivered. The style might range from a highly illusionistic setting, in which we might recognize three walls of a room with complete furnishings, to a more theatrical setting in which we recognize some practical objects which only suggest the full environment. The tone of the set usually reflects the dramatic genre: for example, tragedy may use a darker or less varied color pallette and a few, large objects, whereas comedy may use a brighter and broader color pallette and many realistic or comically exaggerated details. 3. The set gives the first information on time period and location. A gothic cathedral will tell the audience the play will be set in Medieval Europe, but a fast food restaurant will probably indicate contemporary America. 4. 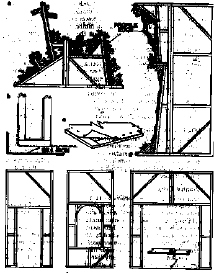 Each script presents unique practical problems which must be solved by a designer; often these practical problems will help determine the concept and other design decisions for a play. For example, Miss Saigon requires a helicopter to land on stage, and Phantom of the Opera requires a chandelier that swings from high over the audience down to the stage. Once a designer has found a way to achieve either of these effects, he has begun to establish a style and determine how the stage must be used in the production. 5. The set designer must coordinate and integrate the scenery with the other elements of the production: costumes, lights, sounds, actors, staging needs, and special effects. The effect of all of these elements should be an integrated whole. The director works most closely with a director and lighting designer; because the set designer's the groundplan is necessary to a director when blocking, and the lighting designer must know all about the scenery she will have to light. The set designer has two different sets of tools. One set, the aesthetic elements of visual composition, is similar to those of other visual artists. The other tools are the practical objects used to create stage environments; while almost anything can be put into a stage setting, in practical terms the same basic structures are used over and over again. 1. line: the dominant lines of a composition might be vertical, horizontal, diagonal, curved, or spiral. Line itself may dominate the composition or only define the edges of masses. The composition below is dominated by lines that move radially from the center of both the ground and the background. forest) or is it in scale with the actor (an everyday kitchen, a subway car, a corporate office)? 3. composition: how are the scenic elements arranged in space (along an x,y, and z axis)? Along any given axis, the composition might be symmetrical, balanced, or unbalanced. 4. space: positive space is three dimensional space taken up by scenic objects. Negative space is open space, which may be taken up by actors and perhaps by movement of actors and other pieces of scenery. The example below leaves a great deal of negative space, and dwarfs that actor with its massive size and scale. 5. texture: can be two dimensional or three dimensional. Two dimensional texture is variation in color, pattern and material. Three dimensional texture is a tactile property: objects could be rough, smooth, silky, bumpy, gritty. Because stage lights tend to hide an object's texture and because texture is harder to see across a distance, a scene designer usually exaggerates stage objects' textures. 6. color: has four properties. Hue is what we normally think of as color; in paint it is a specific mix of primary colors red, yellow, and blue; in light it is the wavelengths absorbed by the object while the rest of the wavlengths are reflected and caught by the eye. Saturation is how much of the hue, the hue could be faintly or strongly present. Value is the scale from black (value=0) to white (value=100); if you think of converting the colors of a picture into a black and white movie, which is really a grayscale with black and white at either end of a spectrum, you will arrive at the picture's values. Temperature is a metaphor used for the emotional qualities of a color: reds, oranges and yellows are warm colors while blues, greens and purples are cool. All of these aesthetic tools will have metaphorical and emotional qualities for an audience member. Vertical lines might be described as "imposing" and the color red as "passionate" or "violent". These associations are culturally relative; in other words they are not innate but learned. Nevertheless, they can be put to use by a designer who wants his set to have a specific emotional impact on an audience. While it is usually not a set designer's job to decide how her set will be constructed or to actually build her set, she needs to know the common structures used to create stage environments. Flats: are used to make two dimensional, painted scenery. Often they are painted in perspective or with other trompe de l'oeil to give the impression of three dimensional objects. They are usually constructed of canvas stretched over a wooden frame. Walls, whether interior or exterior, are often built from flats, which are then painted and textured to resemble a real building material or interior decoration. Often flats are used together, by hinging them or lashing them, to represent three walls of an interior. They are often anchored to the stage floor with stage braces. 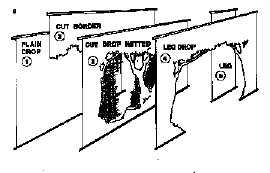 Cutout: is a piece of thin wood or other firm material that is cut to represent an exterior outline of an object. It may be used on its own or attached to a flat; for example, a flat representing the edge of a forest might have a straight edge (the flat) along a tree trunk and then a cutout representing leaves higher up where the foliage begins. Platforms: are used to add levels to stages, whether a few steps up into another room of a house, a second story to a building, or a higher level representing a different location. Wagons: are platforms that move into place onstage or move around the stage. The simplest way to make a wagon is to put castors on a platform. For some shows, tracks and elaborate electrical systems are installed to run wagons electronically. To raise a wagon or other set piece vertically, a hydraulic lift is often used. A turntable, or revolve: is a large circular area of a stage floor that is built to revolve, like an enormous turntable. Anything from an actor to an entire set can be loaded onto the revolve and then spun around into place facing the audience. This was the central scenic device of Les Miserables. Drops: are large, painted canvases hung from battens. They could be painted to resemble a city street, a cornfield, or a night sky. Scrims: are large, loosely woven drops, usually unpainted. Because of the loose weave of the fabric, the scrim appears opaque when lit from a front angle but transparent when lit from behind. Cyclorama: is a large white canvas or plaster structure along the back of the stage. Lighting designers make most use of a "cyc" to create the effect of sky or washes of color across the background. 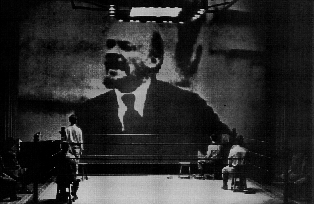 Projections: have been used increasingly through the 20th century as integral parts of set designs. Projections might be still pictures, like slides, or moving images shot on video or film. They might be projected onto a cyc, a flat, or any other object.